The concrete memorial marks the burial site of at least 15 Africans, part of a larger group who were rescued from slave traders' ships in 1860 by the Navy. Adinkra-adorned concrete columns circle the edges of the 1,500-square-foot memorial. The slab itself is covered with a stylized map commemorating the abductees' journey, with 15 superimposed circles marking each gravesite. Dinizulu Gene Tinnie designed the map as well as the pillars, but it was Miami artist Carlos Delgado who brought Tinnie's map concept to life, using materials from Engrave-A-Crete Inc. and SuperStone Inc.
Tinnie was referred to Delgado through Engrave-A-Crete and approached him on behalf of Monroe County, Fla. Delgado, who has a Bachelor of Fine Arts degree in traditional and graphic art and a Master of Fine Arts degree in computer art and 3-D animation, used his gifts to add shading, depth and realism to Tinnie's design. "It was very flat," Delgado says. "For example, part of the sea, the water, was only blue. I said, let's do something more like a mural." To prep the slab, he cleaned with a pressure washer, then ran diluted muriatic acid over the area so pores were open and ready to absorb stain. He washed off the residue and let the concrete dry. Delgado projected the design onto pattern paper, perforated the lines, then transferred it onto the slab, making adjustments where needed. "He decided to approach this project the old fashioned way: patterns, brushes, and stains," says Diana Delgado, Carlos' wife. 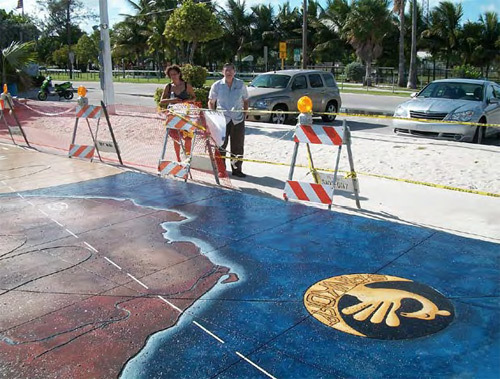 Delgado created the colors needed for the project by mixing Engrave-a-Crete base colors. "He found these stains easy to work with and mix, very similar to oils and acrylics." Diana Delgado says. "The brushes that he used are artist's brushes with natural bristles. He used these brushes to make the artwork look like a painting. Basically, what he achieved is a floor mural painted with stains rather than oils or acrylics." Small circles indicating the graves on the original design were increased in size to have more impact. Delgado created the circles freehand, giving the markers a warm, handmade feel that honors the deceased. 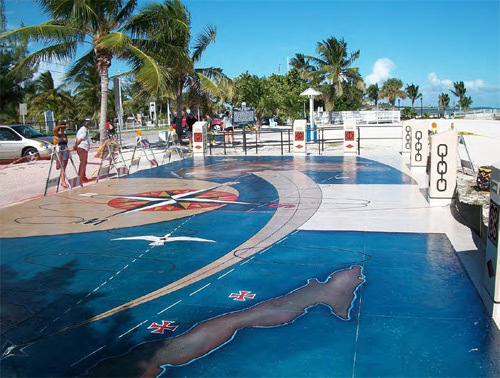 He sealed the mural with several coats of clear solvent-based sealer from SuperStone. The columns surrounding the mural also benefited from Delgado's expertise - he used red, black and beige stains to make Tinnie's textured designs pop, then sealed each pillar for posterity.